Every Thursday I am determined to carve out some personal improvement time. This can be whatever I want including reading, a walk, some ping pong etc. 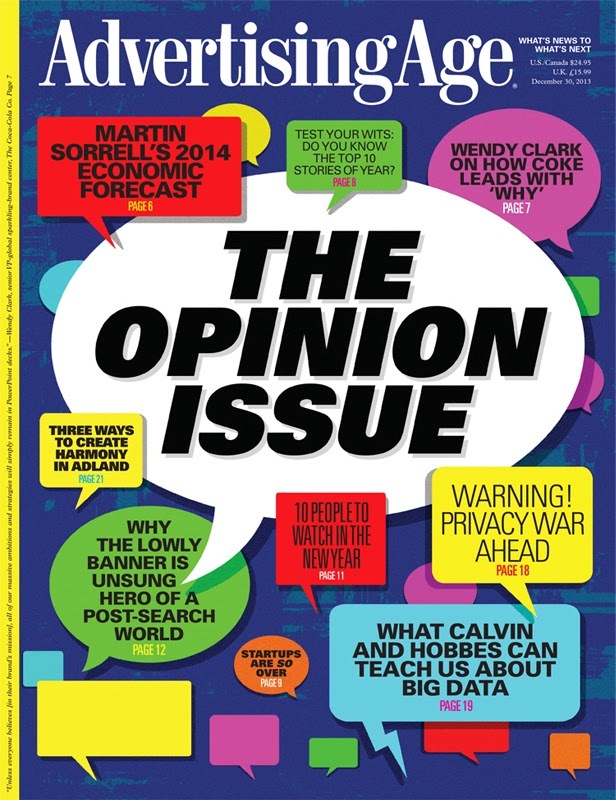 This week I decided to dive into an Ad Age magazine; The Opinion Issue. Overall decent, though there were some articles I absolutely loved. Click the headline below to read the full article. I like this article because it really touches the heart of the problem. So many people don't understand that a brand is worth something. This is why it is so important to do things right the first time out of the gate, then continue to do it as the company grows. I know that you are super excited that you designed the logo yourself in paint or your best friend's son who is in high school will do it for free. Save yourself and your company by hiring someone who actually knows what they are doing. "That said, neglecting a brand is both naive and shortsighted. In some ways, branding is a victim of semantics; call it "reputation" and nobody in the C-suite would ever argue that it's anything less than critical. Corporations intuitively understand Will Rogers' quip: "It takes a lifetime to build a good reputation, but you can lose it in a minute." But management teams commonly underachieve in the application of reputation-management best practices -- in a word, branding." I love that there is a whole pack of women that are wanting more women at the top with them. There are women demanding to be in the C Suite. They are able to juggle, manage and do it all. This is a great quick read on the relation of women and millennials. "They often ask why simple things are so complicated. Technology has provided instantaneous answers and solutions for millennials, reducing their patience for doing the same thing the same way twice. They want to work smarter, not harder. For this reason, managers should be flexible, responsive and open to change from the "clubby" rules that dominate corporate leadership. Women have had decades of experience changing the rules of the game and challenging conventions in fields where they used to be the minority." The only strategy I really liked in this article was the first one talking about talent. It really hits the nail on the head for me. When our parents were children they had to purchase and comb through encyclopedias to get the knowledge Google gives us instantaneously. I'm not saying younger people are smarter, I'm saying they know how to obtain knowledge faster. They don't have to rely on someone for answers, they can go out, get them themselves or create something new from the start. "Survey after survey tells us that employees under 35 are largely unhappy. Not because we don't pay them enough (although starting salaries are still an issue), but because they want to contribute and we're not letting them. We have to realize that millennials have been creating content for most of their lives. Be it videos, photos, song lyrics or drawings, they are used to sharing and receiving immediate feedback. Agency structures don't encourage or celebrate that kind of contribution from the start." A 13 year old just recently delivered a TED Talk about education that I think relates really well to this exact topic. Watch the video of this young man who is living, learning and schooling me.